It's another very busy weekend in the wrestling world and the guys and here to get your through it. After checking in with Big Brother and other news items, the guys are joined by Mandy to cover the wrestling news, including the passing of Bobby "The Brain" Heenan and preview WWE No Mercy and Mark joins Blake to preview ROH Death Before Dishonor and review BCW Fall Frenzy, including Mark meeting The Franchise Shane Douglas. Sit back and enjoy! 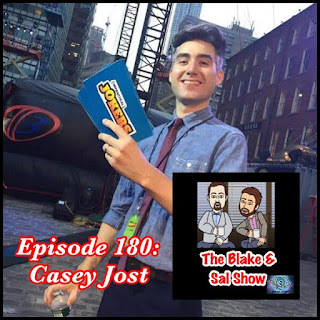 In the guest host seat this week is a special guest, Casey Jost, one of the producer from Impractical Jokers. The guys discuss the history of the show, various punishments or challenges, how the guys are behind the scenes and much more. Even if you aren't a fan of the show, you should still listen to this interview, it's a fun one. In this special marathon edition, Blake & Sal have Mark & Kyle in studio for a jam packed show. 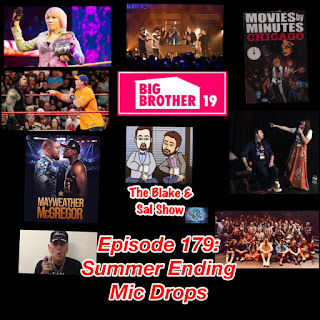 Discussion includes Crystal Beth talking Movies by Minutes Chicago, Big Brother, Crossroads: Backstreet Boys/Florida Georgia, Mayweather/McGregor, some UFC, NHL and US Open talk, get an update on Ric Flair, discuss Asuka's NXT Women's Championship reign ending, injuries, new singing, Dad's continuing hatred of Jeff Jarrett, Roman Reigns and John Cena's epic promo and more.